Discover the traditions in Provence. Saint Barbara's Wheat: Beginning of the traditions of Christmas in Provence. Christmas Cribs and Santons: The crib represents Nativity and is composed of figures called “santons”. 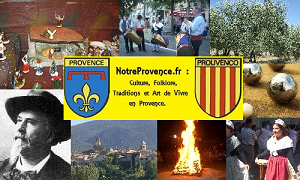 Cacho-Fio: One of the oldest traditions in Provence ! Great Supper: This is a typical Christmas Eve supper, the most important one in Provence. The 13 desserts: Served after the midnight mass, this tradition remains the most celebrated nowadays. The Shepherd's Celebration: An old tradition, celebrated during the Midnight Mass. Click here to go back up in the top of the page! © Copyright : All pictures and photographs of this site must not be used without our agreement.